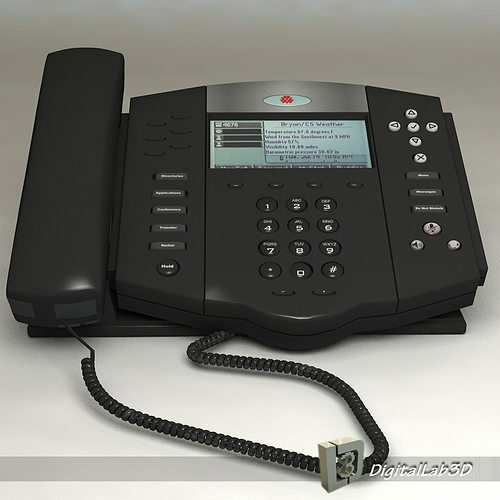 A 3d detailed model of Polycom Telephone. Complete with color map. This model is ready for 3d animation/presentation. This model is consist of different model conversions such as 3ds, max, maya, lightwave etc. This conversions can be open in any latest or old 3d software package. Polycom entered the video conferencing market in 1998. Polycom introduced the ViewStation product line which included models with embedded multipoint capabilities, content sharing capabilities, and support for the emerging H.323 IP network protocol. In 2000, Polycom introduced a personal desktop video conferencing appliance called ViaVideo. The compact device was essentially a webcam with onboard processing capabilities, to offset the compute limitations of most desktop and laptop computers at the time. As computer processing power increased, Polycom transitioned the desktop solution to a software-based client called Polycom PVX.